Our copper saucier set offers four popular sizes with lids, each ideal for recipes that require frequent stirring. With curved sides to ensure vital ingredients are incorporated completely, these practical sauciers perfect the art of sauce making. The superior heat distribution of copper provides accurate temperature regulation while the stainless steel linings assure you of pure flavour intensity. Rustic, durable cast iron handles and unique brushed surfaces for ease of care. 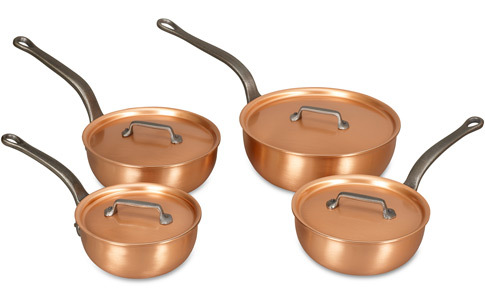 We know you'll love this	copper saucier set	as much as we do. The best saucepans I have ever used Very happy with my copper cookware purchase as well as the fine service received from the folk at Falk. The staff were really helpful and my pans arrived the next day all very well packaged. The build quality of these is superb. They are very solid and look fantastic in our kitchen. So good I have just bought a rack to display them instead of hiding them away in a cupboard. They are easy to clean as well. The range of sizes in the set is perfect for any cooking task. 1106 customers found this review helpful. Did you? Yes, I did! Fantastic quality and so easy to use These pans are hanging up in our kitchen and they just look fabulous. Using them is a dream. Consistent heat, responsive to changes and easy to clean once the meal has been prepared. They are and will be a treasured possession for a lifetime. Many thanks to Falk Culinair for producing such an excellent product. 1067 customers found this review helpful. Did you? Yes, I did!